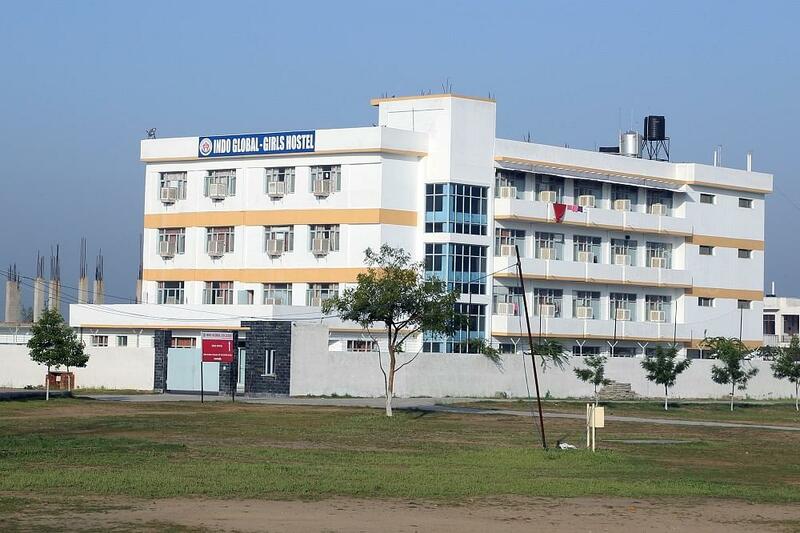 Indo Global College of Engineering is one of the constituent colleges of Punjab’s leading educational group, Indo Global Colleges. 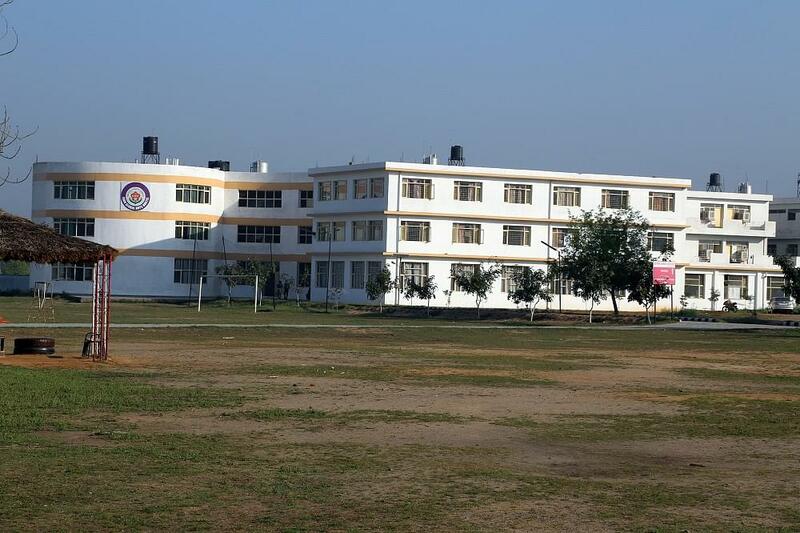 The Institute is located in Mohali, Punjab and was established in the year 2003 with a motive to provide quality education in the field of Engineering. 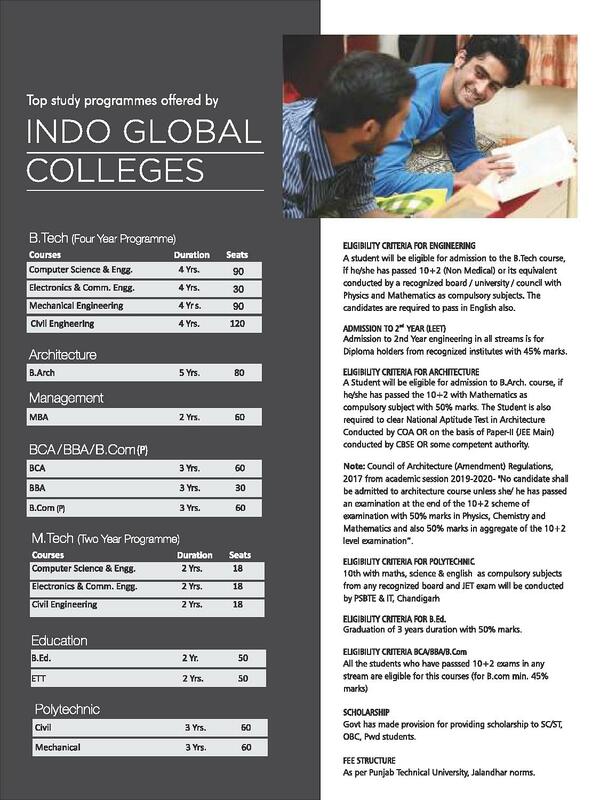 Indo Global College of Engineering is affiliated to I.K. 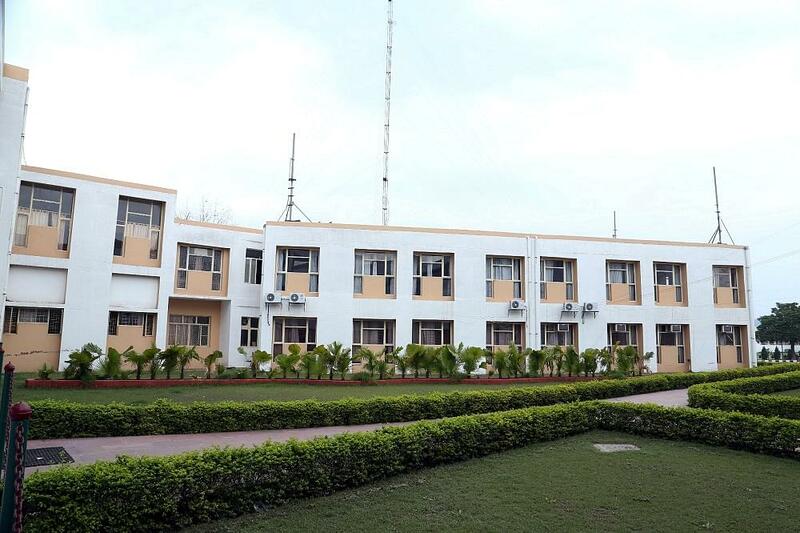 Gujral Punjab Technical University (IKGPTU), Jalandhar and is approved by All India Council for Technical Education (AICTE). 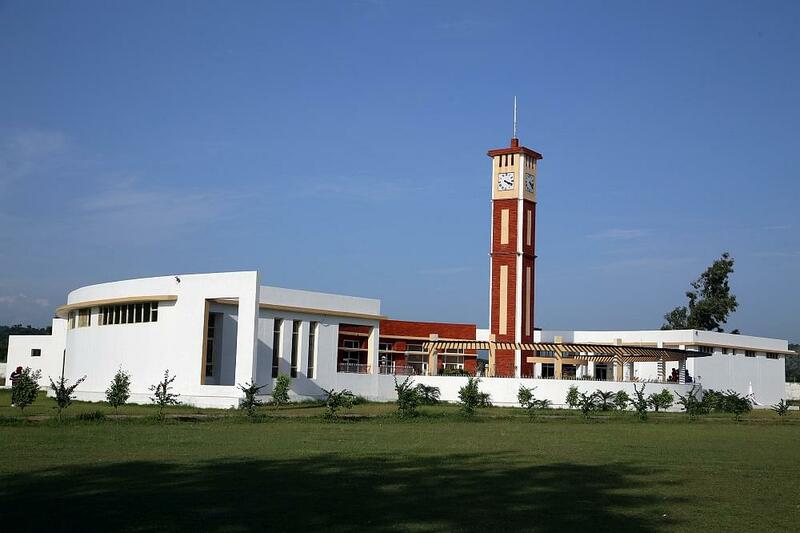 Courses offered by the Institute are B.Tech., Diploma in Engineering and M.Tech. Admission to the four-year full time B.Tech. program is offered to candidate with 60% marks in 10+2 (with Physics, Chemistry and Mathematics as the subjects). Final Selection to the course will be done on the basis of JEE Main Entrance Exam Score. Lateral Entry to B.Tech. program is open for candidates who hold B.Sc. Degree or Diploma in Engineering/ Technology. IGCE offers three-year full time Diploma programs in Civil Engineering and Mechanical Engineering. The minimum eligibility required to take admission in Diploma programs is having passed 10th Standard with Mathematics, Science and English as the compulsory subjects. Final Selection to the Diploma program will be done on the basis of scores obtained in JET Entrance Exam conducted by PSBTE & IT. Candidates with BE/ B.Tech./ M.Sc./ MCA Degree (Relevant Stream) with minimum 50% marks are eligible to take admission in M.Tech. course. Final Selection to the course will be based on GATE Entrance Exam sore. 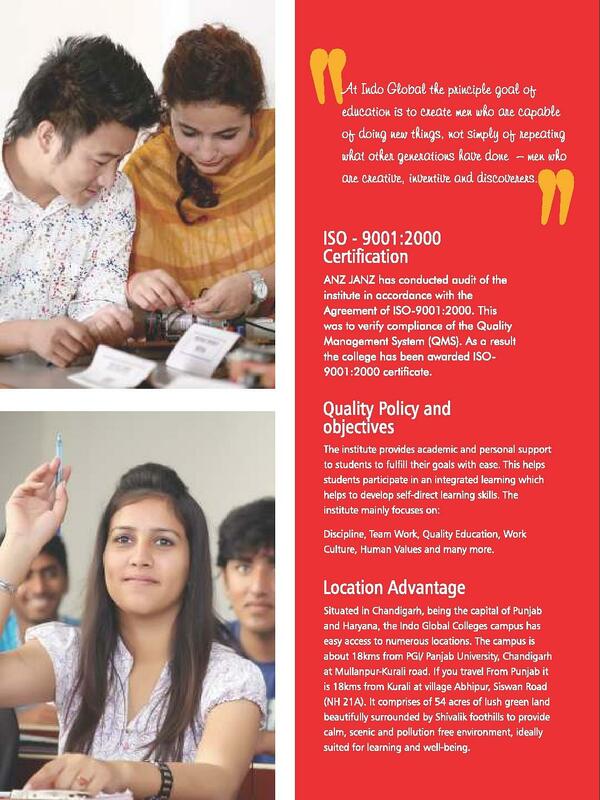 Indo Global College of Engineering has a dedicated Placement Cell that works on making the Candidates placement ready. It provides Industrial Training opportunities during the course of study so that the students are able to gain the practical knowledge. The Placement cell also works on Interpersonal Skills and communication skills of the students. Various Group Discussions, Mock Interviews, Aptitude Tests and PowerPoint Presentations are organized to fit the candidates according to the requirements of the recruiters. 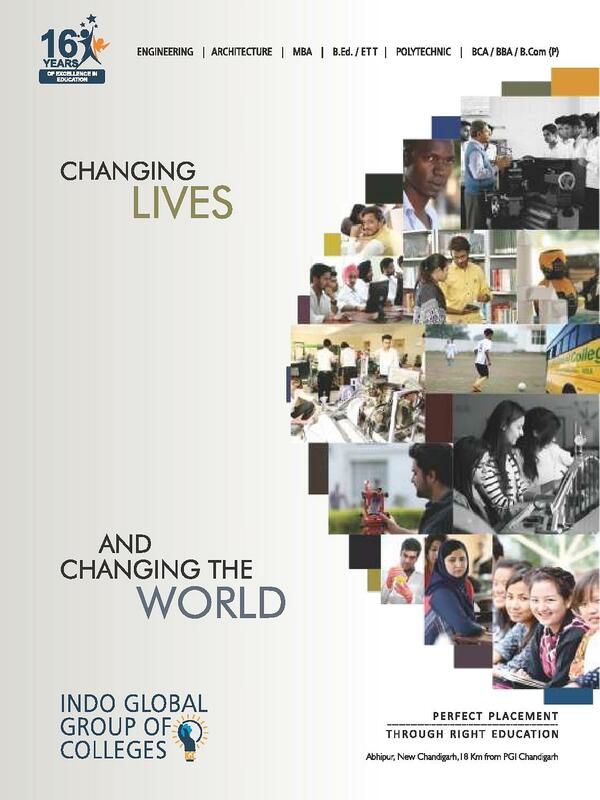 Why Join Indo Global College of Engineering? Guest Lectures through the Industry Experts helps in Imparting Industrial Knowledge to the students. 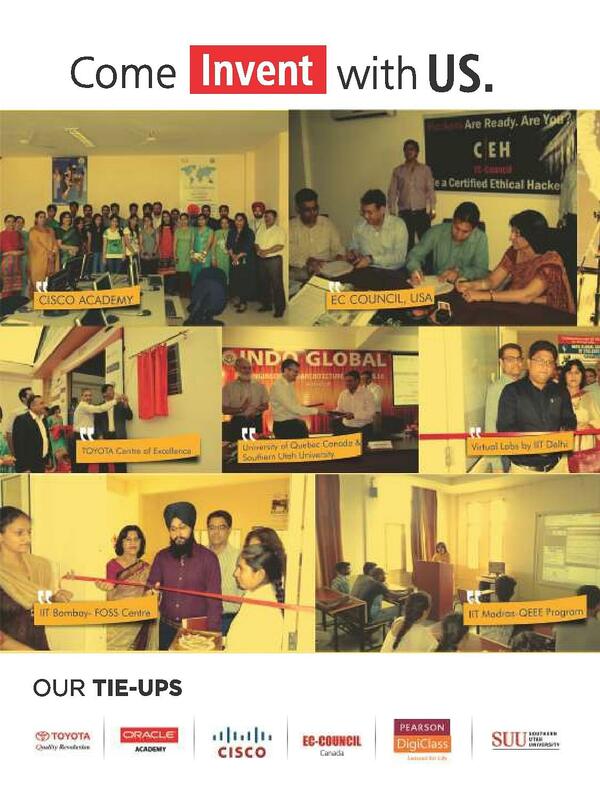 The Live Projects organized by Campus Business Park leads to skill development. Availability of Digital Classrooms and E-books to enhance learning experience. National and International affiliations and tie-ups helps in bringing up numerous projects for the students. Career Counselling and Training programs helps the students in grabbing the desired job. It is a developing college day by day. College authorities are working on it to make it progressive as much as possible. and try to give every type of facilities to the students as their need. So this cheap and west college. Good about college is discipline, peaceful environment of college, clean and green campus, best learning & placements was there. My experience in college has given me a chance to sharpen my skills in my field of choice. There have been, and there will continue to be, many opportunities to learn more ways of improving my craft as a result of my time in school, which I am truly thankful for. Our college is amazing. It is free from city noise asd is situated in a sceneric and beautiful area. College infrastructure and management is great. I don't have a single bad comment or review about my college. My all needs are fulfilled in this college. CET, I got 10000 Rank in that test. I opt for this college because I thought it is near by Chandigarh. 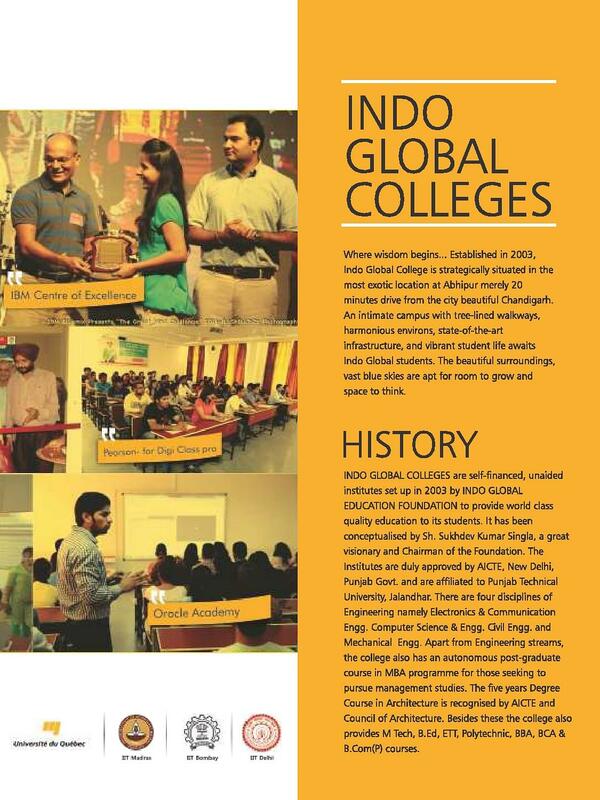 I originally decided to attend Indo global college because of its strong general academic reputation and its close proximity to my home, which gave me the opportunity to continue working at my part-time job. The professors are truly world class and challenge me to take my industry understanding to the next level. My education has given me an excellent foundation for becoming an immediate contributor in the technical. I have given AIEEE exam my score was 1.5 lakh rank i chossed this college because the staff of teachers are highly educated and have deep knowledge about their subjects they are teaching.